Kim Tipper is a fine and dedicated luthier, a supporter of the arts in our community and an enthusiastic amateur musician. With over thirty years experience in the craft, he strives to offer the best attention and care to instruments and their owners with a view to history and to music. Kim was born in Ottawa, Ontario and finished his education in Vancouver before living for twenty years in Saskatchewan where all of his children were born. In Saskatoon he took up instrument making and opened his first violin shop, before re-locating to Victoria in 1995. Kim also indulges his interests in art, history, philosophy, good food, fine coffee and the Italian language. Reid is known around the world as a fine bow maker and restorer and we are pleased to offer his expertise and skill to our customers. 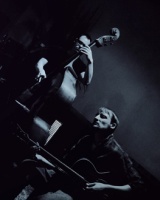 Reid was born in Toronto where he studied double bass with Tom Monahan before moving to Ottawa where he apprenticed with Joseph Kun, a Czech violin and bow maker and shoulder rest inventor. His traditional training in Kun’s shop helped develop his deep appreciation for the history of the craft and the French tradition of bow making. In 1980 Reid and his young family moved to Vancouver Island where he has developed his skills and reputation. 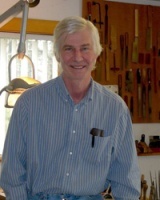 In recent years he has taught bow making at courses regularly held in Arkansas and Japan. See www.reidhudson.com. Galen Hartley is a Victoria-born luthier and is well known as a guitarist and song-writer. His interest in violin making began as an employee at Larsen Music when Kim helped set up their repair shop in 2006. 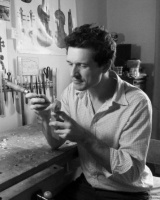 Galen later came to work at Tipper Violins, and then in 2011 moved to Montreal to continue his work as a luthier in the shops of Tom Wilder and Olivier Perot. 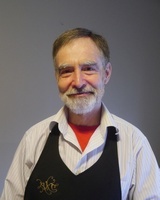 In the fall of 2012 Galen worked for several months in the shop of Tony Echavidre in Bordeau, France supported by a grant from the Quebec government. Galen continues to build new instruments in his Montreal workshop and occasionally assists the renowned luthier Isabelle Wilbaux. Tipper Violins is proud to have sold more of Galen’s fine violins than any other shop. See hartleyviolins.com. 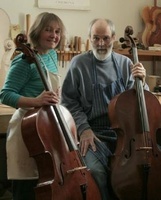 Canadian luthier Gregory Walke and his German wife and collaborator Sibylle Ruppert both studied at the Welsh School of Violin Making in the early 1980’s before working for a few years in Germany. They have been established in Paisley Ontario since 1988 where they make new instruments and do fine restorations. See gregwalke.com and acellorondo.ca.